Finnish Robbe’s Little Garden (Robbe’s lilla trädgård) is a pioneer of smart technology assisted greenhouse and vertical farming. The Lapinjärvi based garden grows herbs and salads energy efficiently while the technology giant Fujitsu tests and develops their cloud service in the garden. The service enables mobile management of the entire farming production. The rest of the garden’s high technology is all Finnish knowhow. Thanks to its long, dark, and cold winters Finland is an attractive place to develop energy conservative and automated vertical farming. Resource and energy efficiency enable financially feasible plant production. With vertical farming no growing space is wasted. The smart technology optimising the growing conditions and the closed-cycle design save water and energy and produce a delicious pesticide-free crop. The reduction in water consumption may be 60 to 80 per cent and about 50 per cent in energy consumption compared to regular greenhouse production. The Finnish pioneer of vertical farming is based in Lapinjärvi in the Uusimaa region. The founder of Robbe’s Little Garden drafted his first vertical farming plans in 2010. 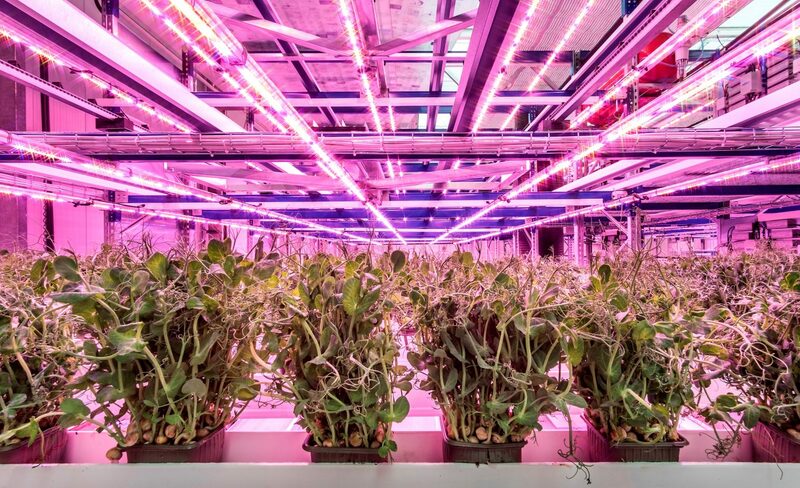 Six years later the automated lighting, cooling and dehumidifying technology for greenhouse farming had developed enough for vertical farming to start looking like a feasible option. The first vertical farming trial was run in the summer of 2017. The primary aim of the trial was to improve the salad and herb farm’s efficiency. In addition to increased farming area the herbs are ready a week earlier compared to a regular greenhouse. At best the trial farming has increased closed loop crop productivity by 40 per cent. Slightly surprisingly the flavour of the herbs improved as well. The closed loop design and automated systems of the trial plantation make climate control easier than before. In a closed environment pesticides are unnecessary as well. New food production methods and their development are a global interest. The 2 million euro collaboration agreement between Robbe’s Little Garden and the Japanese technology giant Fujitsu is a prime example, aiming to further improve the efficiency of greenhouse farming. The modern greenhouse works as a test platform to which Fujitsu brings their information and cloud knowhow such as their sensor and remote observation technology. Fujitsu’s Akisai cloud platform has been especially developed for collecting and analysing farming data. Cloud services enable continuous monitoring and wireless control of the greenhouses. The continuous data collection enables increased crop yields by optimising the growth environment. The rest of the greenhouse technology, such as the water-cooled LED lighting and temperature control, are all Finnish technology that was interesting to Fujitsu. The consumption of herbs in Finland has increased significantly. Dill, basil and parsley are among the most popular herbs. Holidays cause visible consumption peaks. Robbe’s Little Garden produces annually about 4 million salad and herb pots. The majority of the herbs and salads are consumed locally in the Uusimaa region and about 5 per cent is exported to Sweden. The garden is expanding in summer 2018 thanks to this technology collaboration one of its kind in Europe. The highest level of the new automated vertical greenhouse will be at six metres and the farming area will increase from 500 square metres to 4,900 square metres. The investment will increase the overall production area to 1.5 hectares. Read more about Robbe’s Little Garden.